Jeg er takknemlig forå være med på et så interessant prosjekt. Takk for 14 å r med alle involverte i freq_out og alt det har ført til. born in Bodø, Norway in 1965, artist educated in Fine Art at Goldsmiths College, London, with a background in mathematics, chemistry and fish ecology from Oslo University. She exhibits and works all over the world, but her base is in Oslo, Norway. Winderen researches hidden depths using the latest technology; her work reveals the complexity and strangeness of the unseen world beneath. The audio topography of the oceans and the depth of ice crevasses are brought to the surface. 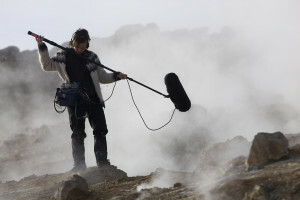 She is concerned with finding and revealing sounds from hidden sources, both inaudible to the human senses and sounds from places and creatures difficult to access. She is currently working on a project concerning the ice zones the Arctic in collaboration with Sonic Acts festival, an ongoing project for TBA21: Silencing of the reefs and a full-length release for Touch, among many other projects. RELEASES The Wanderer, 2016, Ash International. Out of Range, 2014, Touch. Debris, 2012, Touch. EXHIBITIONS Interrupting the Surface, The Meštrovićev pavilion, Zagreb, 2016. DIVE, New York Department of Transportation, Park Avenue Tunnel, New York, 2014. Ultraworld, MoMA, New York, 2013.